Fermented soya product, blueberry, with added calcium and vitamins. 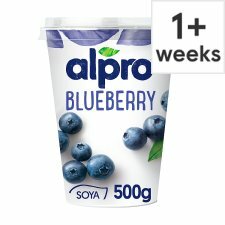 Alpro® Blueberry is packed with berries and thanks to our carefully selected fruit has a sweet, juicy flavour. Delicious by itself or why not try using it in a smoothie or adding fresh fruit for a delicious snack.